Introduction There is a perception that women are under-represented as speakers at emergency medicine (EM) conferences. We aimed to evaluate the ratio of male to female speakers and the proportion of presenting time by gender at major international EM conferences. Methods Conference programmes of the major English-speaking EM conferences occurring from 2014 to 2015 were obtained. The number of presentations, the gender of the speaker and the duration of each presentation were recorded. Results We analysed eight major EM conferences. These included 2382 presentations, of which 29.9% (range 22.5%–40.9%) were given by women. In total, 56 104 min of presentations were analysed, of which 27.6% (range 21%–36.7%) were delivered by women. On average, presentations by women were 95 s shorter than presentations by men (23 vs 21 min 25 s). Conclusions Male speakers exceed female speakers at major EM conferences. The reasons for this imbalance are likely complex and multifactorial and may reflect the gender imbalance within the specialty. Concerns have been raised about the number of female presenters at medical conferences. This study demonstrates that a minority of speakers at emergency conferences are women. We examined major emergency medicine (EM) conferences (English speaking associated with national bodies) to determine the ratio of female to male speakers and the proportion of time devoted to both male and female speakers in the published scientific programmes. Conference programmes between 2014 and 2015 were obtained from conference websites or conference organising committees. We recorded the number of presentations, the gender of the presenter and the scheduled duration of their talk. For sessions with multiple speakers, we divided the time equally among those presenting. Sessions where the gender of the speaker could not be determined through local knowledge or Google search were not included. Session chairs were not included in the analysis. We excluded poster sessions, preconference and postconference workshops and industry-sponsored sessions. We determined the proportion of EM specialists in each country associated with a national conference through published data from representative bodies (eg, colleges). We analysed eight conferences during the period 2014–2015 (table 1). We found 2382 presentations, of which 741 (29.9%) were given by women. 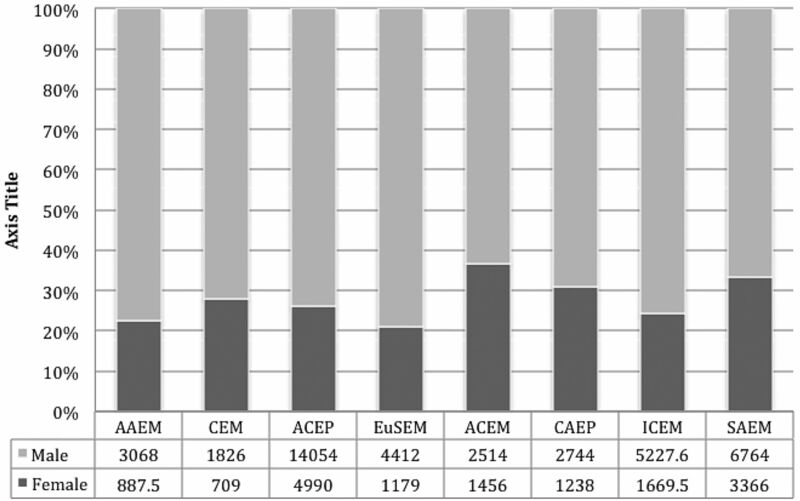 The proportion ranged from 22.5% (European Society of Emergency Medicine (EuSEM)) to 40.9% (Australian College of Emergency Medicine (ACEM)) (figure 1). Proportion of speakers by gender. AAEM, American Academy of Emergency Medicine; ACEM, Australian College of Emergency Medicine; ACEP, American College of Emergency Medicine; CAEP, Canadian Association of Emergency Medicine; CEM, College of Emergency Medicine; EuSEM, European Society of Emergency Medicine; IFEM, International Federation of Emergency Medicine; SAEM, Society for Academic Emergency Medicine. We identified 56 104 min of presentations, of which 15 495 (27.6%) were delivered by women. At every conference analysed, more speaking time was devoted to male speakers than to female speakers. 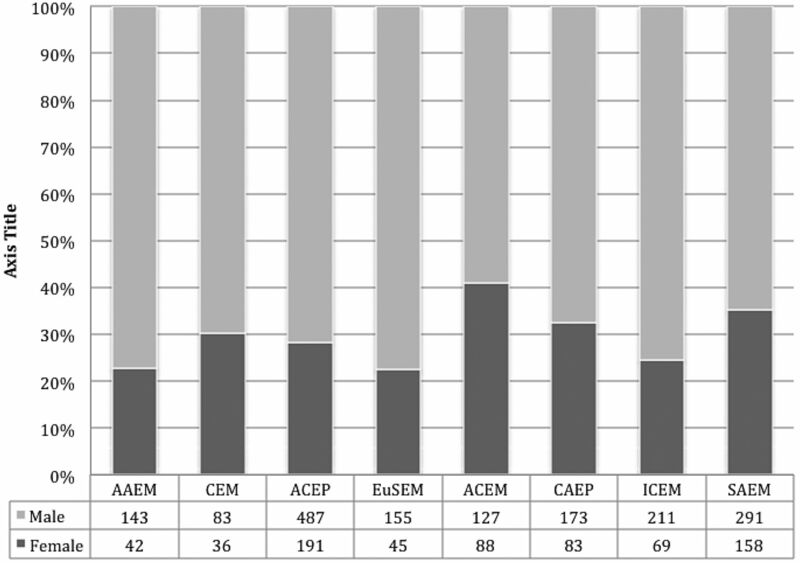 The proportion of time devoted to female speakers ranged from 21% (EuSEM) to 36.6% (ACEM). Presentations delivered by women were on average 95 s shorter than presentations given by men (23 vs 21 min 25 s) (figure 2). Proportion of time spent talking by gender. AAEM, American Academy of Emergency Medicine; ACEM, Australian College of Emergency Medicine; ACEP, American College of Emergency Medicine; CAEP, Canadian Association of Emergency Medicine; CEM, College of Emergency Medicine; EuSEM, European Society of Emergency Medicine; IFEM, International Federation of Emergency Medicine; SAEM, Society for Academic Emergency Medicine. Table 2 shows the gender distribution of EM specialists in countries linked to the analysed conferences. We found that women speak less frequently and on average for less time than men at EM conferences. Gender differences in other professions are not uncommon, and reasons are multiple and complex.4–6 Conference organisers may seek to attract speakers who are renowned as academics, clinicians and those in visible leadership positions. Men, as a proportion, predominate in these roles2 leading to an availability bias. Women may be less likely to volunteer to speak at conferences4 perhaps due to familiarity with public speaking, increased difficulty with finding time to attend conferences or even the perceived gender imbalance of the past conferences. However, the finding that conference gender balance reflects the proportion of women accredited in the specialty argues that the ratios are a function of the workforce and not a result of the conference organisation process. This represents a more fundamental gender imbalance in the medical hierarchy, the reasons for which are beyond the scope of this paper. However, it can be argued that a different gender balance at conferences may attract women to the specialty. This study has limitations. We sampled a single year and thus we are unable to determine whether these findings represent a year with unusual findings or whether these data are part of an ongoing trend. The conferences samples represent the higher impact conferences in EM such that we cannot extrapolate to other national, local or regional conferences. We determined scheduled speaking time as opposed to actual speaking time. Women are in a minority as presenters at EM conferences. On average, a female speaker speaks for less time than a male speaker. Those attending, speaking or organising major scientific conferences should consider gender balance. Contributors SDC, RB, IB, KH, MJ and NM conceived and designed the study. All authors sourced, analysed and recorded data. All authors contributed to the manuscript creation and revision. SDC takes responsibility for the paper as a whole.